Like a steaming bowl of Borscht with a shot of Arak, Masha’s mid-winter party will leave you feeling warm all over! Featuring a stellar cast of collaborators and guests who will guide you on a sensory and sensual journey, expect oriental sounds, deep groove, a touch of Flamenco, dextrous improvisation and something original – Masha’s melting pot is deep and fragrant. Each performer is a renowned exponent of various forms of Global styles, with specialist experience among the group spanning Egyptian, Greek, Jazz, Flamenco, Brazilian, Spanish, Cuban, Middle-Eastern, Funk, Klezmer, Turkish and a many other styles, the resulting blend is a 100% locally sourced, free range, organic Australian original. Many more special guests and performers to be announced! 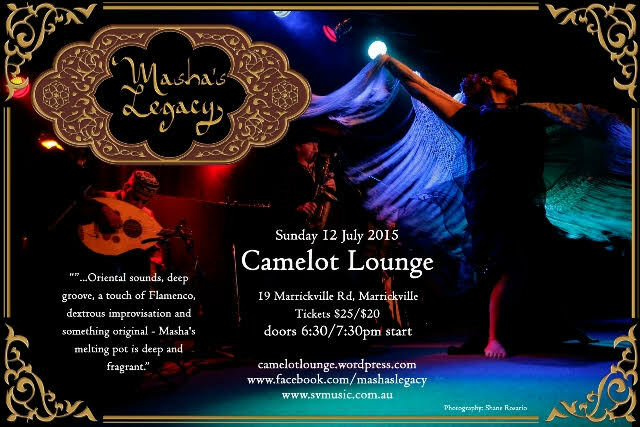 Masha’s Legacy present unified dance and music performance of Eastern-influenced original compositions and select arrangements from traditional repertoire including Arabic, Middle-Eastern, European and other Oriental traditions: from spiritual to folk, classic to popular.